Choosing Components for the DRV8811 Stepper Driver « Adafruit Industries – Makers, hackers, artists, designers and engineers! 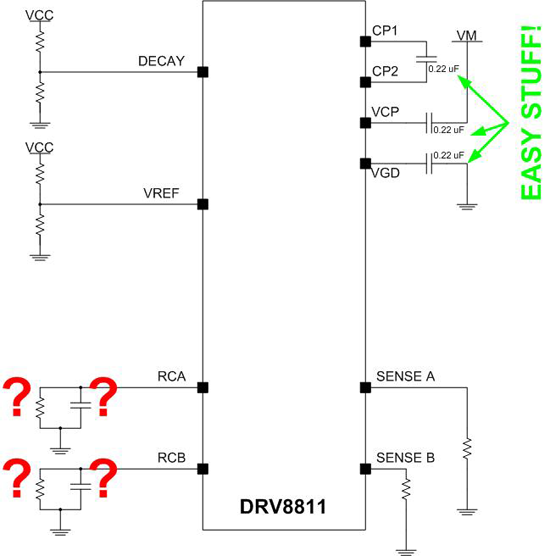 The DRV8811 is clearly a bipolar stepper driver that makes our lives considerably easier. It is just so simple to drive a stepper with this powerful device, as well as similar internal indexer microstepping engines, who takes care of all the nuances of phase commutation and current control. Just supply your stepping rate in the form of a square wave with the desired frequency and a direction signal, and WALAS! Your motor moves! Caps needed for the charge pump and the internal regulator are a piece of cake. The datasheet is more than clear than three ceramic caps of 0.22 uF value should go in between (1) CP1 and CP2, (2) VCP and VM and then (3) VGD to GND. The voltage? The CP1/CP2 and VCP/VM caps I would make 50V just to be safe. The VGD cap can be 16V as this is a 10V node. But how about the components needed to properly configure the RC pins RCA and RCB? These are harder to allocate as now we need to understand what is going on with the current regulation engine! In fact, selecting these components is not a trivial endeavor. Make them too big and your switching frequency is too slow, with a high pitch squaling noise making your life miserable. Make them too small, and the switching losses increase, removing total power dissipation capability from the H Bridge’s power FETs. We need to match these values as close as possible to the optimal set of parameters in order to maximize out output. This task may seem daunting and annoying, but I assure you it is quite simple. Read the whole article on his blog.